This week Twipe was proud to host the Digital Innovation Tour 2018 at our office in Leuven. 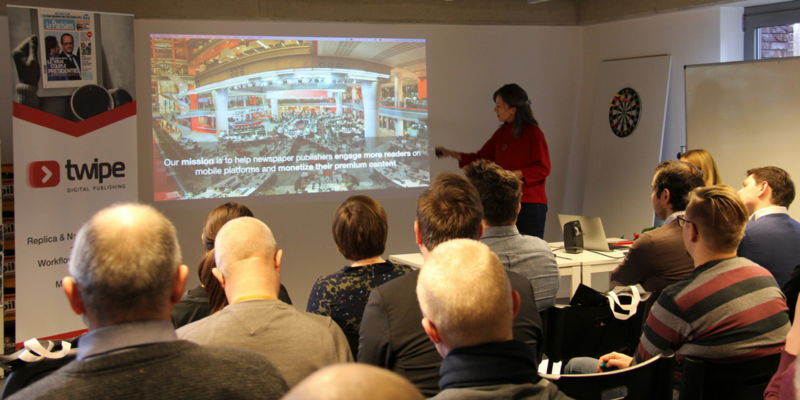 A group of Danish editors and broadcasters stopped in Leuven during their Northwest European tour to hear about the digital media innovation happening in Belgium. Earlier in the tour, the group stopped in Amsterdam where they met The Playwall, the Dutch startup with the new way for readers to ‘pay’ for digital content, as well as the Next Media Accelerator in Hamburg. During the event in Leuven, we heard from Danny Lein, Founder and CEO of Twipe, on the future of media, learned about imec.istart, and discovered the innovation scene in Leuven thanks to Leuven Mindgate. There were also two sessions held in the PechaKucha style. The first session saw Dana Nastase speak about Twipe Digital Publishing, plus two Belgian startups spoke. Fan Arena is where digital innovation and sports marketing come together, with software that allows users to acquire, grow, and convert sports fans through engaging digital experiences. Tinkerlist is a content management system that streamlines the production workflow of television making to allow editors to work collaboratively. In the second session, Georg Aigner presented on the ePaper analytics tool EngageReaders, while two other local startups presented their work. LucidWeb is a platform providing publishers with the tools to manage and publish VR experiences. Display.direct automatically places product ads based on site content and user behaviour, with their platform connecting advertisers’ inventory to publishers’ content. Of course with such an innovation-focused group joining us, we couldn’t let them leave without learning a bit about how they are approaching innovation themselves. We spoke to three of the participants: Rasmus Emborg from Børsen, Kristoffer Hecquet from altinget.dk, and Mads Emil Sejrbo Lidegaard from Kristeligt Dagblad. Working with Lasso News, Børsen will create a robot that will help them report financial news faster and more accurately than human reporters can. In addition to the robot writing stories itself, it will also provide predictive suggestions to reporters by learning from existing content. Editor Rasmus Emborg explained that this project came from a desire to be innovative. A winner of Google’s 4th round of its Digital News Initiative, Rasmus Emborg said the project wouldn’t have happened without the funding from Google. Editor Rasmus Emborg cautioned that it might be naive to think robot-produced content would be as high a quality as content produced by human journalists. Still for content that does not require originality, such as stock market reports or financial information from companies, which is very common in a financial newspaper like Børsen, the quality will be high enough. This will free up more time and resources to create original content. Another Google DNI winner, Kristeligt Dagblad’s editorial paywall optimisation tool works to increase the conversion rate per article compared to fixed paywall placements by enabling journalists to choose and dynamically test the best placement of the paywall in their articles. Now a part of every article on k.dk, they have seen an increase in clicks on the paywalls and conversions from the paywalls specifically. While the idea is to have a paywall personalised to the needs of each individual article, there has been an interesting finding that on average it is better to have the paywall higher up in the article–depending on the headline. The next step for Kristeligt Dagblad is to move beyond an article-specific paywall to a reader-specific paywall. Based on recency, frequency, and other behavioural data, they will then be able to calculate the optimal paywall position. Altinget, an independent news site about politics, will create a news product aimed specifically for readers between the ages of 13-18, targeting young people before they vote for the first time. The idea for this product comes partly from the changing media landscape, with young people becoming media consumers earlier than before, and a fear of fake news, so young people need to have a neutral source of political information. This will be a completely new target group for Altinget, which currently has mainly readers 55+. 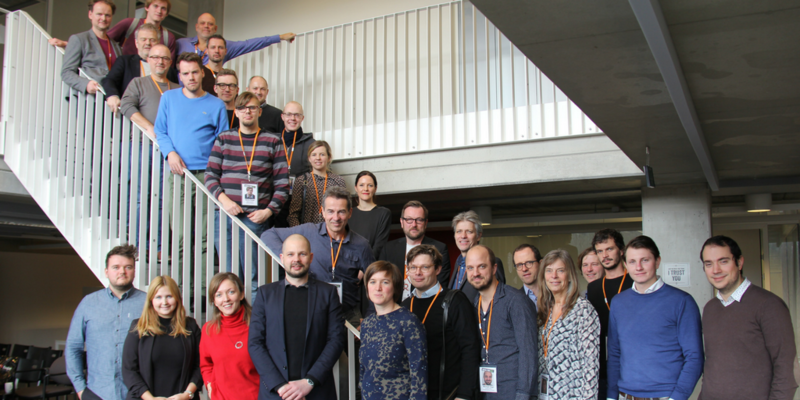 In preparation for this product, the team at Altinget has started to reach out to other initiatives with similar target groups. Kristoffer Hequet, the project manager for this initiative, believes being open about their project will be the key to their success. With funding from the Association of Danish Media, the new product will go live later this year. It will have an emphasis on reaching the younger generation on channels and platforms they are already on. The project is still in its early stages (it doesn’t even have a name yet) and it will be a very iterative process, so the news product will take a few different forms before a final form is decided upon. This entry was posted in Industry news and tagged artificial intelligence, Digital Growth, Digital Media Europe, Digital publishing, Innovation. Bookmark the permalink.